Botanical Name: Isatis indigotia Fort. Part Used & Method for Pharmaceutical Preparations: The leaves are gathered in summer or autumn and dried in the sun. Active Ingredients: Its active ingredients include indirubin, isatin B, glucobrassicin, neoglucobrassicin, glucobrassicin-1-sulfonate, and indigotin. Properties & Taste: Bitter and very cold. 1. Sore throat, erysipelas, boils, carbuncles and furuncles. Isatis leaf (Daqingye) is used with Scrophularia (Xuanshen) and Honeysuckle flower (Jinyinhua). 2. High fever with maculopapule. Isatis leaf (Daqingye) is used with Moutan bark (Mudanpi). 3. For the syndromes of heat invasion of ying and blood division and intense heat in both qi and blood division, manifested as high fever and delirium, masculas and eruptions, hematemesis and epistasis, it is used in combination with the blood-cooling and detoxicating drugs, as rhinoceros horn and capejasmine fruit. 4. 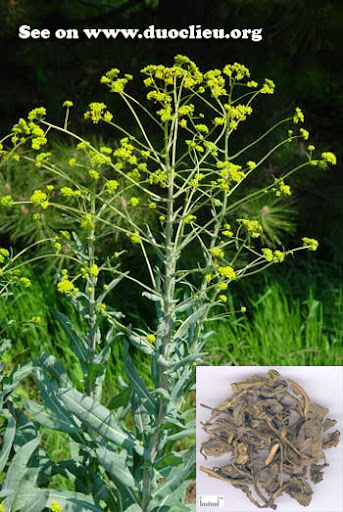 For swollen and sore throat, canker sores in the mouth, skin and external diseases caused by excessive fire and noxious heat dormant in the body, it is used in combination with the heat-clearing and detoxicating drugs, such as scrophularia root, coptis root, dandelion herb, etc. In addition, in clinical practice this herb was used in recent years to cure viral diseases, as influenza, measles, and hepatitis. Cautions & Contraindications: This herb is contraindicated in cases with weakness and cold in the spleen and stomach.